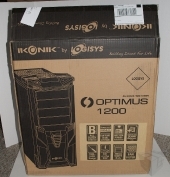 Here today we have a new case from Ikonik by Logisys, the Optimus 1200. 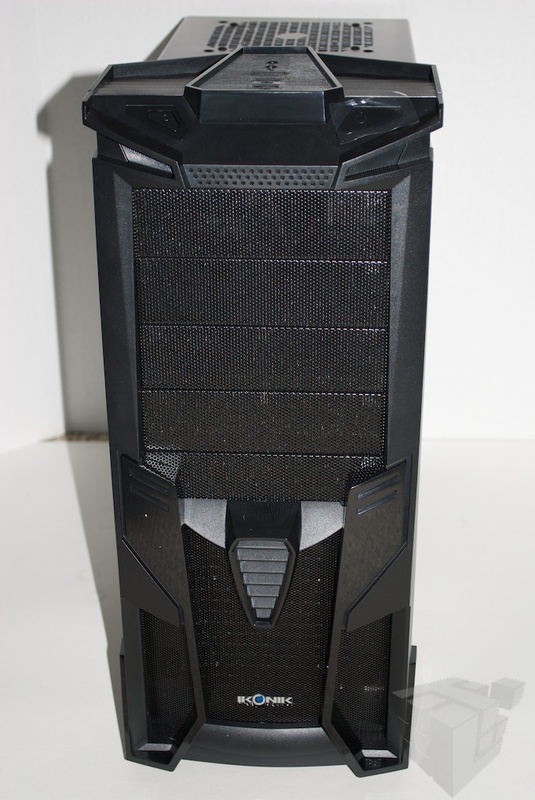 This case, well, it looks a lot like Optimus Prime, but aside from that, it’s got some nice features too. 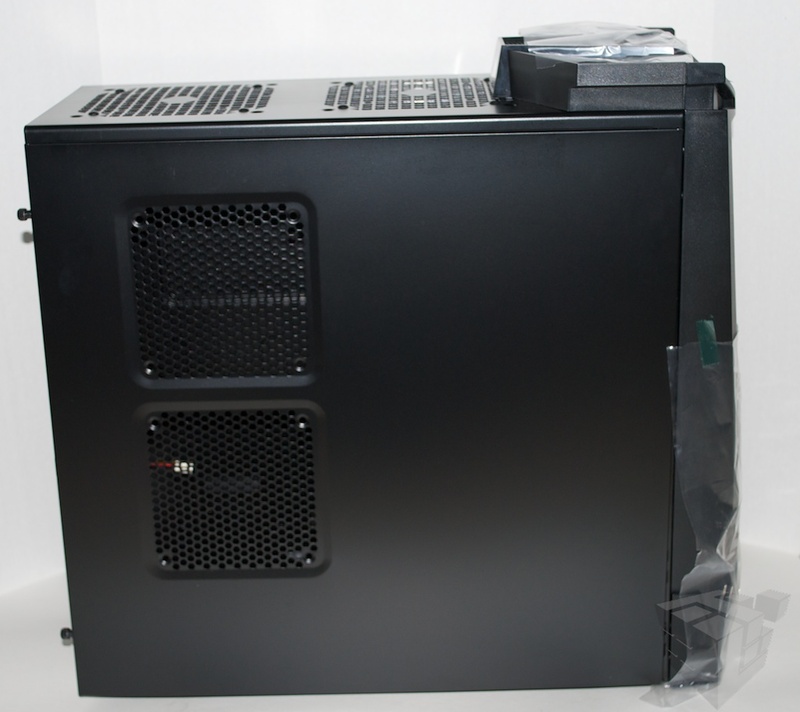 The Optimus 1200 has a bottom mounted power supply, 5 fan mounts, and is able to fit two ATI 5970 Graphics cards which are 12.9in (330mm). 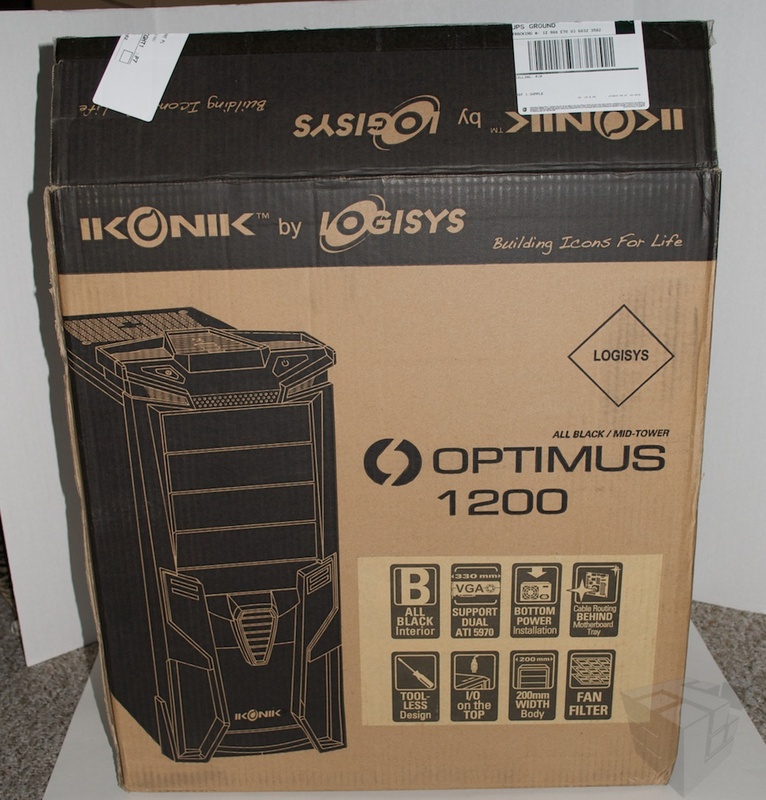 With that said, lets check out the Ikonik Optimus 1200. The Optimus 1200 comes in a brown and black box with a full diagram of the case on the side as well as all of it’s features. 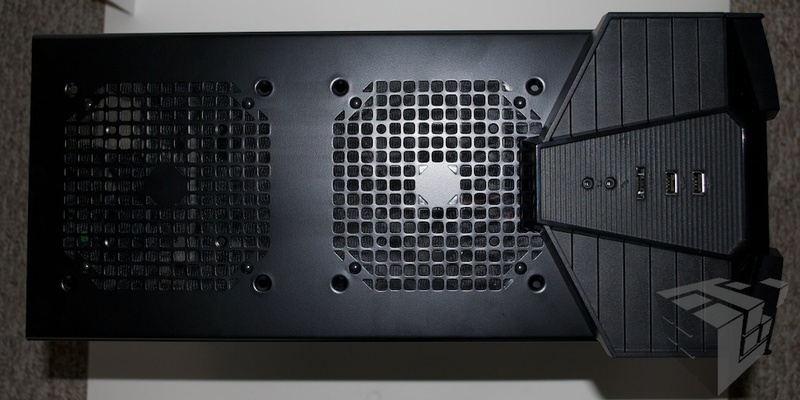 The model I received is the TAC 2.0 and comes with the 2 120mm fan mounts on the side panel. The front is a very solid and secure plastic molding shaped to resemble Optimus Prime. Ikonik took the time to make sure scratching doesn’t occur during transport and affixed plastic sheets to the surface. The finish of the plastic is very glossy and easily shows finger prints. 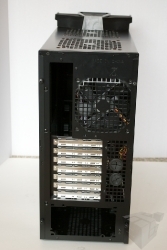 This case only comes with one fan. It comes with the rear fan. This makes the case very flexible for modders. Another nice feature is routing room behind the motherboard. 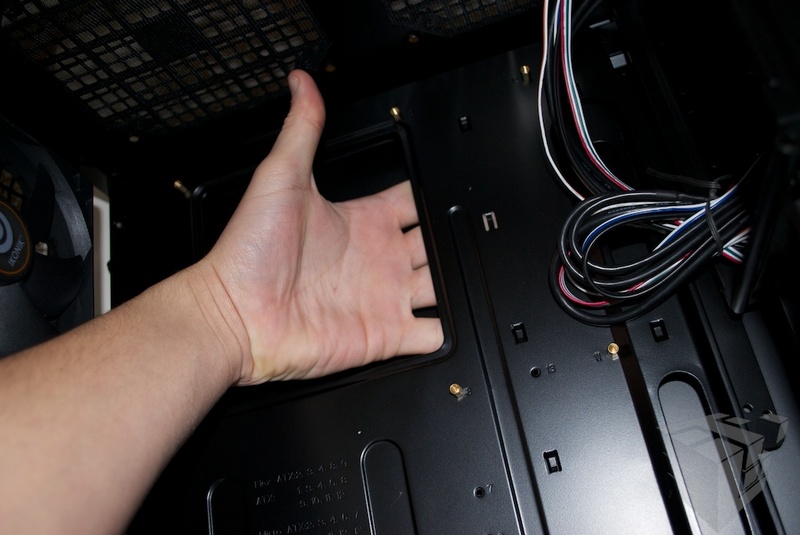 I can easily fit all of my fingers behind the motherboard tray. This room is perfect for cable management, as well as light placement for those looking to bring this case to life. After taking some pics I decided it was time to start installation. This is where I ran into some problems. 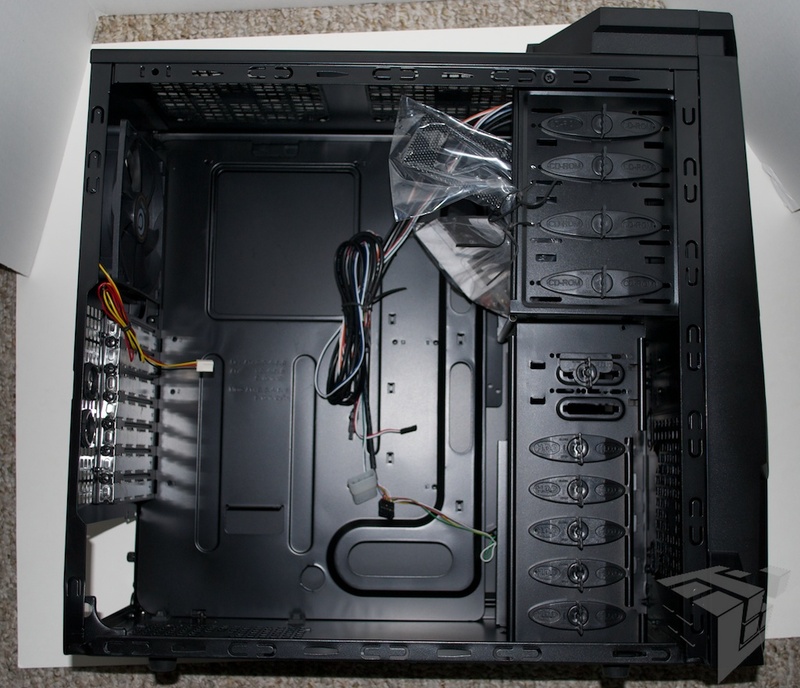 While the case supports many great features such as 5 hard drive bays, extra long graphics cards and ATX case placement, you can’t really take advantage of all of them all at once. At least not with every motherboard. 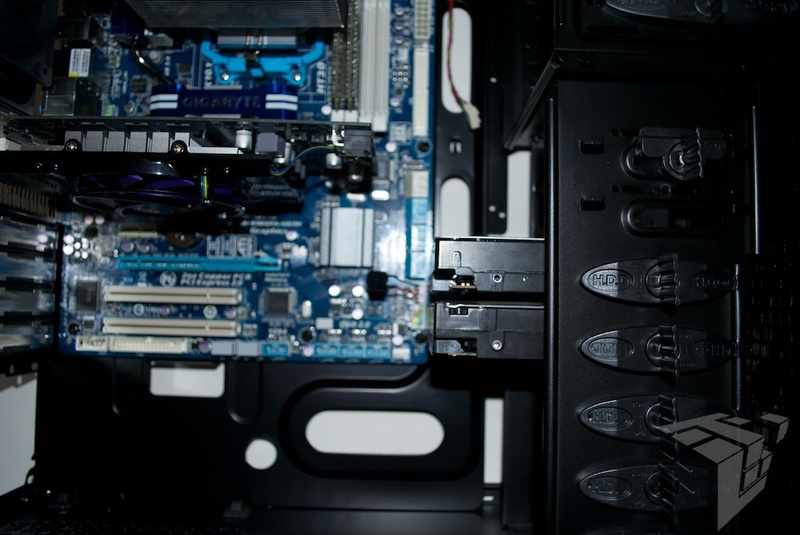 After I installed the motherboard, I noticed the case felt a little cramped, so I installed two hard drives as well. This is where I found my first problem. 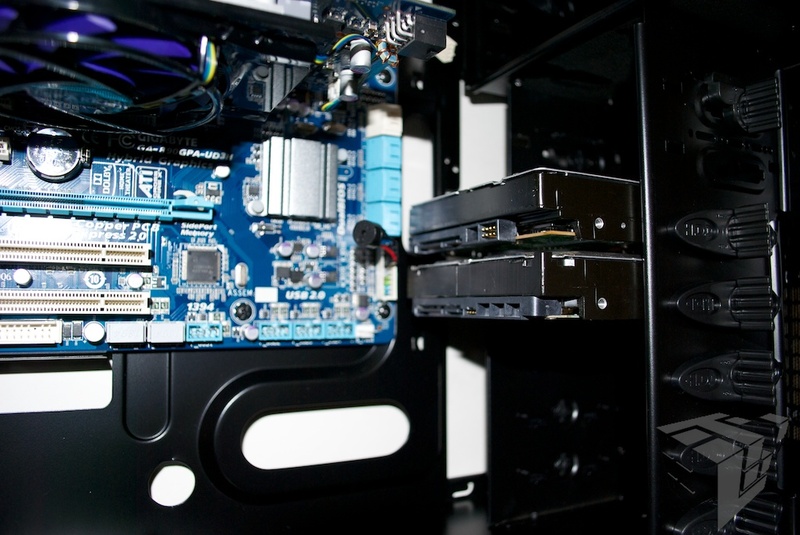 The hard drives are very close to the motherboard. Normally this wouldn’t be so much of an issue, but because of the placement of the SATA slots on my Gigabyte motherboard prevents me from using the top two hard drive bays. At the same time I found that the non-removable hard drive cage is also very flimsy. It’s simply two pieces of metal parallel to each other with nothing joining them together. Adding to this the fasteners for the tool-less hard drive system is extremely inconvenient and also flimsy. To install a hard drive you have to remove both side panels to gain access to both sides of the tool-less system. This could have easily been avoided had they turned the cage sideways with the drives facing the side. This led me to question whether the Optimus 1200 could even hold two ATI 5970 graphics cards, let alone one. So, I pulled out my tape measure. 330mm is approximately 12.9 inches. And from the picture you can see that this case will not fit a GPU of that size. And not even close. 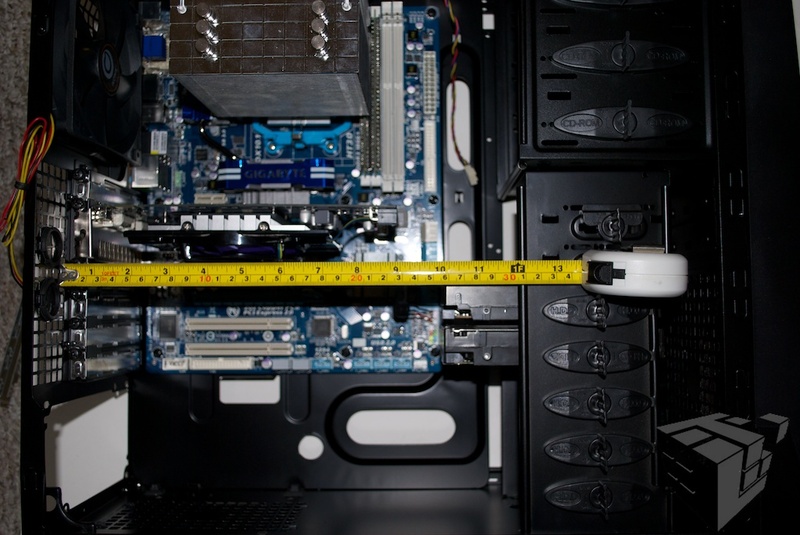 And even if it could fit a card that big, you’d most likely have to give up a hard drive bay. In the end, I can’t really recommend this case because It doesn’t do what is says it can do. However, it does look really cool and is perfectly fine for most people. I still don’t like the hard drive cage, but it’s not the worse thing I’ve seen. So, if you want a case that’s perfect for modders and looks cool, but doesn’t really live up to it’s packaging, then get this case. Otherwise don’t.